I made bread! I made bread! There are some things on my Life List that I knew would be pretty easy to accomplish, but some really intimidate me. Making bread from scratch is one of them. So much can go wrong in the process, it seems- kind of like making pie crust (which I have yet to tackle). I’ve really wanted to bake homemade bread over the years, but didn’t want to fail. 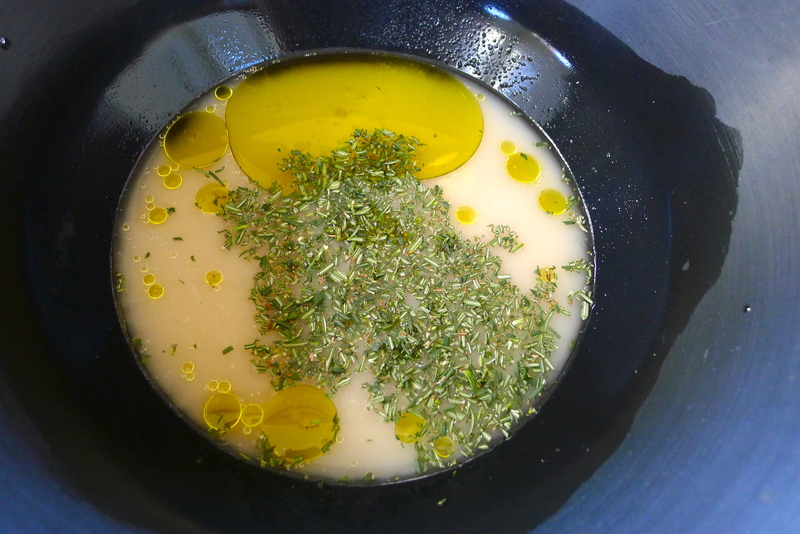 I came across a recipe that seemed straightforward and thought, No time like the present. 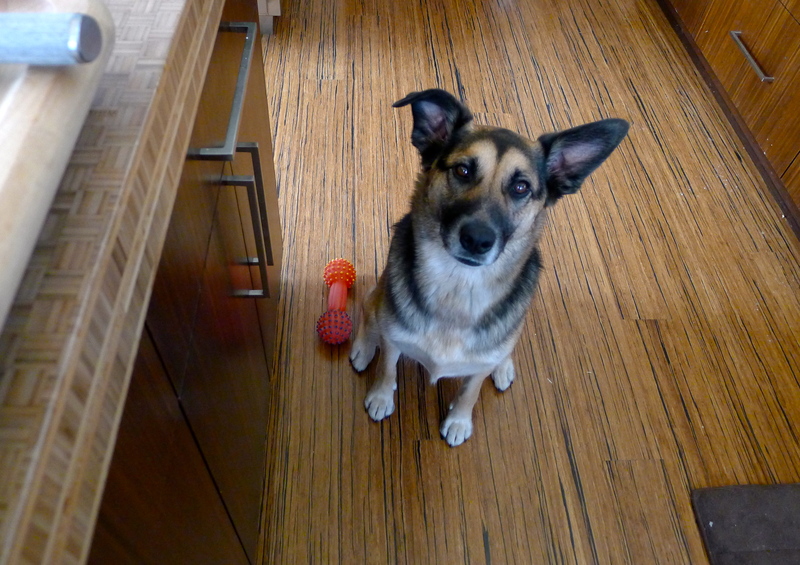 I even had all of the simple ingredients on hand (and a really cute assistant). 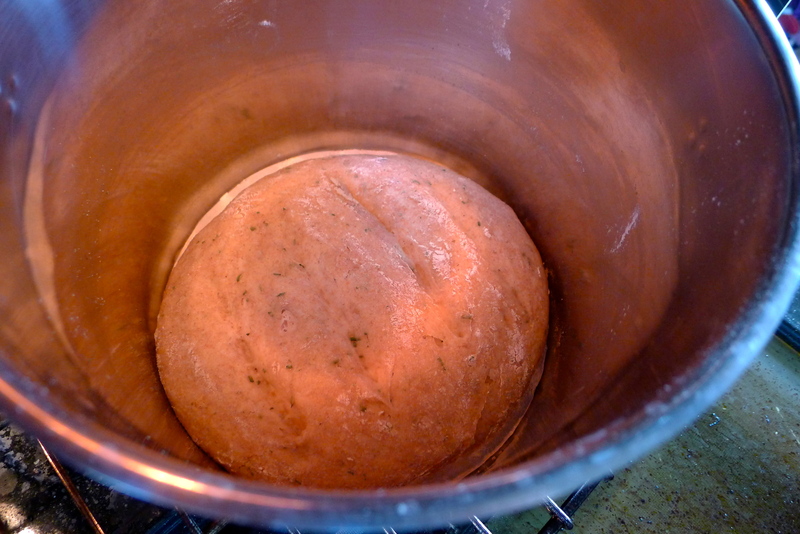 The recipe was unique; I’d never heard of baking bread in a pot, and it required no kneading. 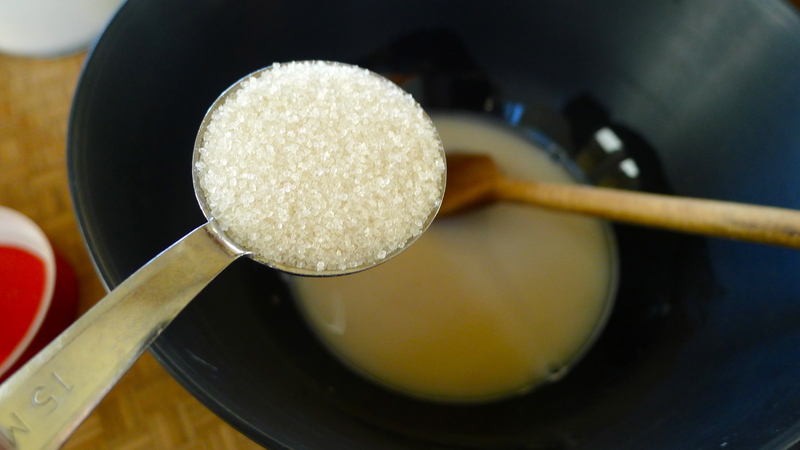 To start, I poured warm water into a bowl and added yeast and sugar. 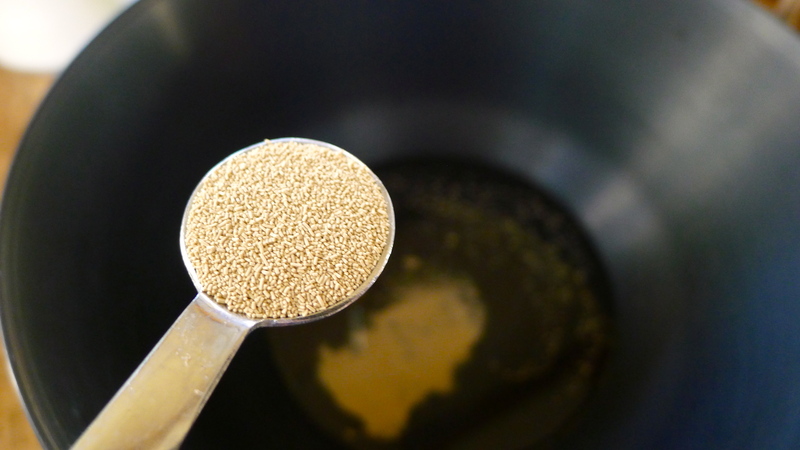 (Disclaimer: my yeast was not fresh, and I think that makes a big difference.) 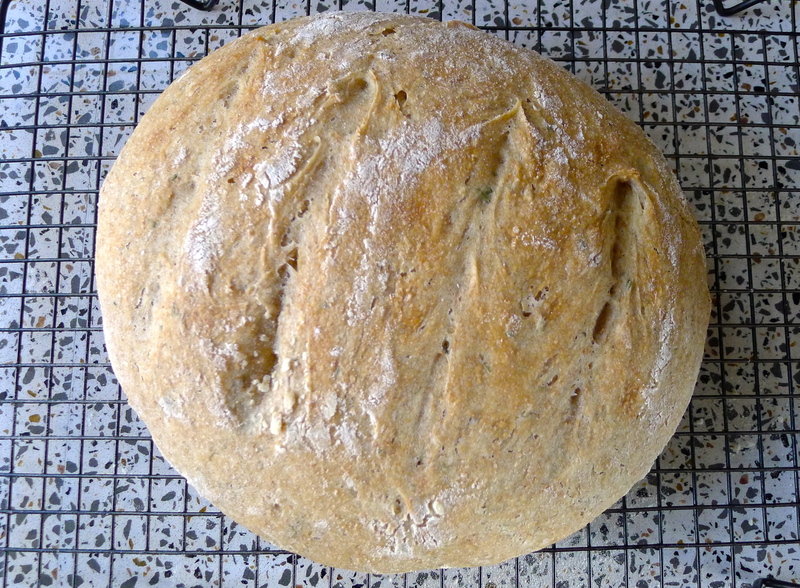 After I let it wake up the yeast for five minutes or so, I added the rest of the ingredients: salt, olive oil, some fresh chopped rosemary, whole wheat and regular flour. 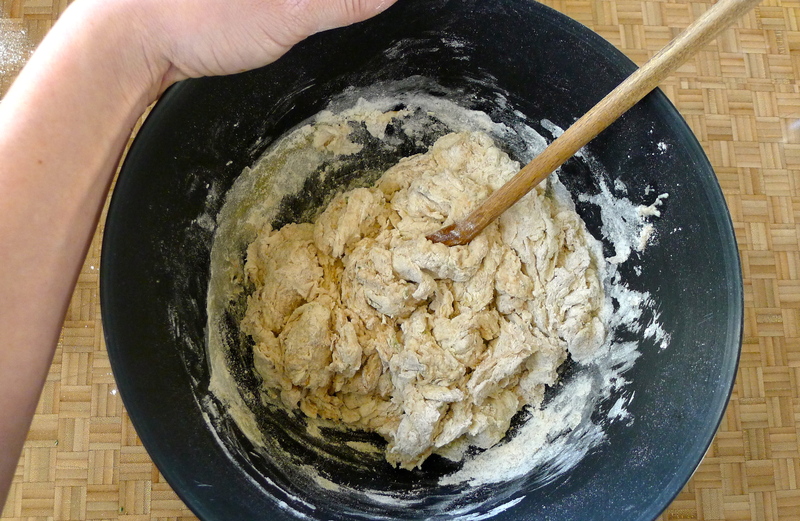 Within a few minutes of stirring, I had a ball of sticky dough. 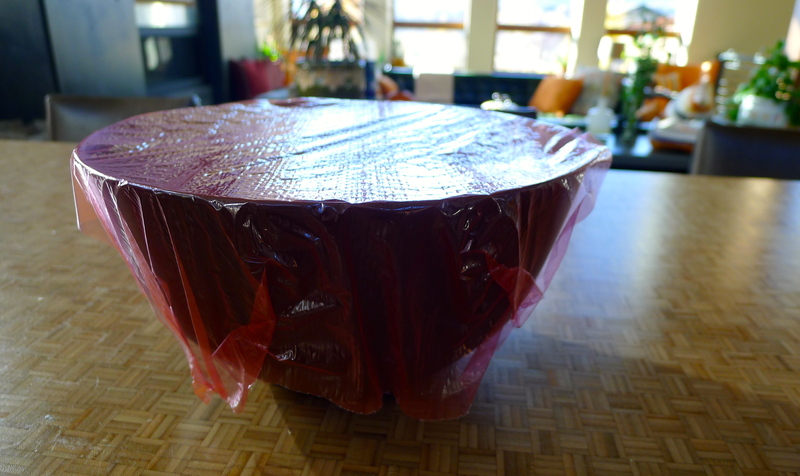 As instructed, I covered the bowl and let it sit for an hour. It didn’t rise much, which I think is because of the age of the yeast. 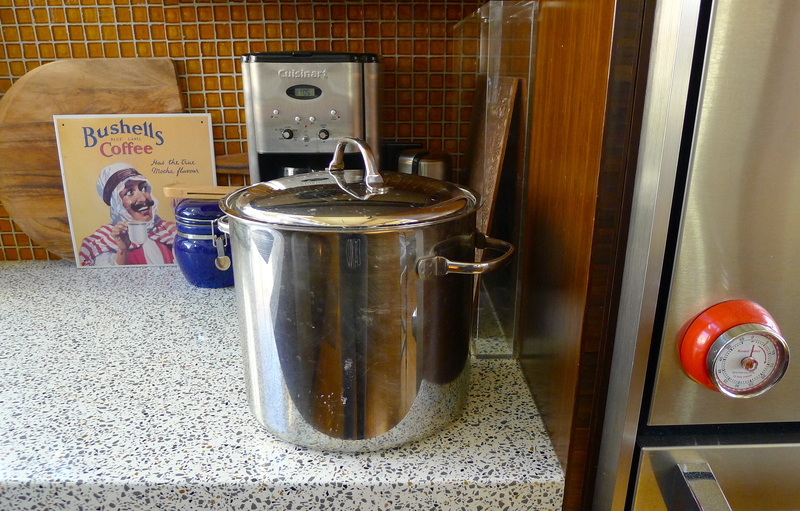 While the dough did its thing, I prepped my baking pot. 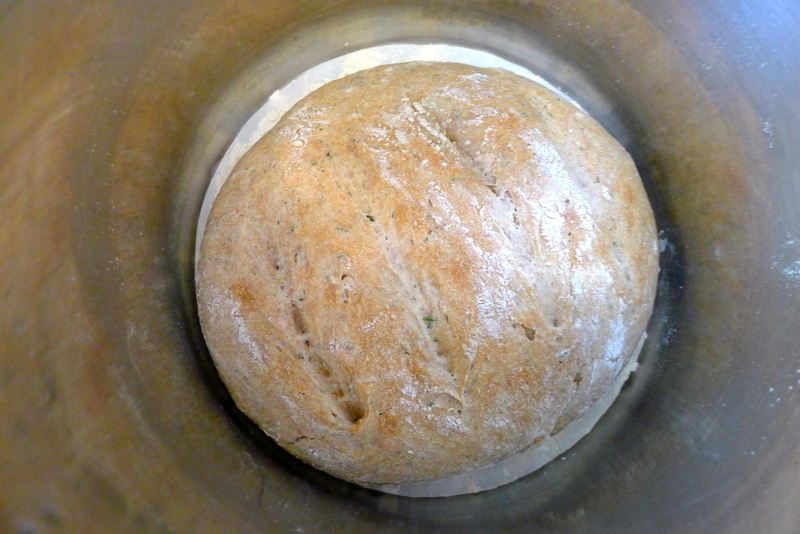 I used a tall soup pot because the base of it seemed like a good bread loaf size, but I could have used a smaller pot. 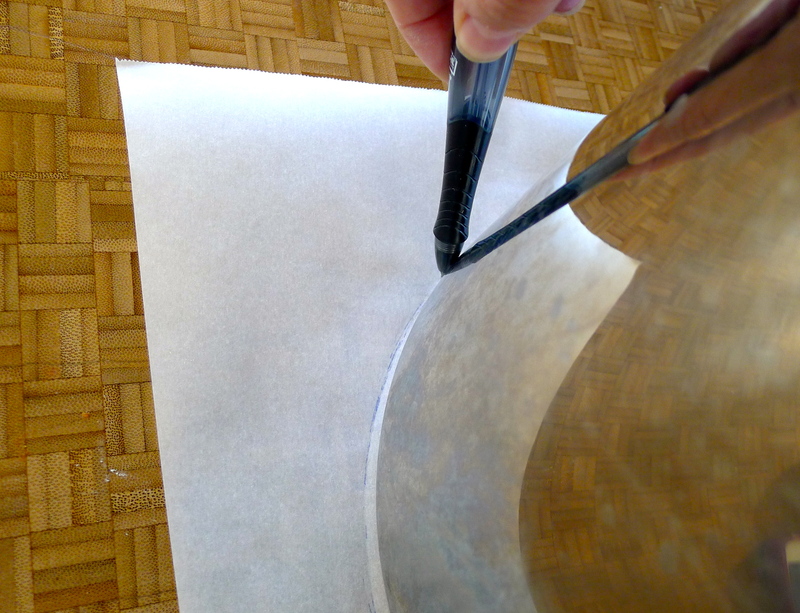 I traced a circle around the pot on a piece of parchment paper and cut it out. I sprinkled flour over the bottom of the pot, placed the parchment paper circle in it, and added more flour. 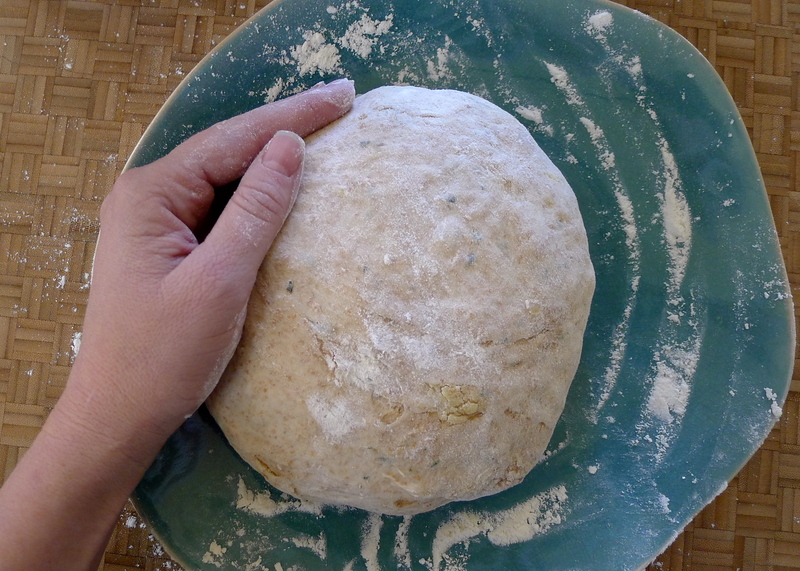 After an hour, I turned the sort-of-risen dough onto a floured plate and flipped it a couple of times to coat it. I smoothed it into a ball and placed the ball in the pot. I set it on the counter with the lid on for another 45 minutes. It was supposed to double in size, but I was satisfied that it had grown at all. I cut slits into the top of the dough ball, put the lid on the pot, and stuck the whole thing in the oven for about a half hour. Since the dough hadn’t done what I expected it to, I wasn’t sure what the finished product would be like. I was amazed when I opened the lid to check on the bread. It looked like…a loaf of bread! After cooling for a bit in the pot, I took the loaf out and marveled at my work. While it cooled, I walked past it in the kitchen multiple times in awe. 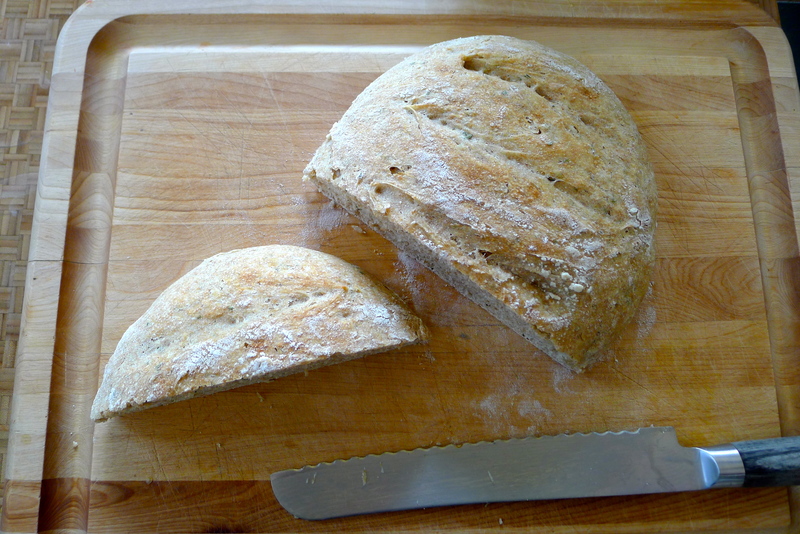 It was beautifully browned and dusted with flour and looked like bread from the bakery. And the kitchen smelled like Heaven! I didn’t wait for it to cool completely before slicing into my Wonder Loaf. A light slathering of butter seemed appropriate. With the first bite, I knew this method was a success. 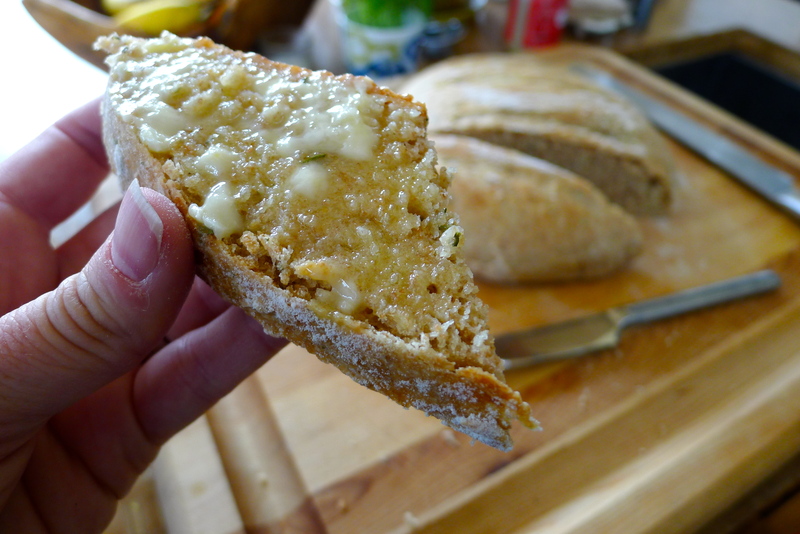 The outside was crusty and the inside had a slightly dense chewiness, just the perfect texture with a hint of rosemary. 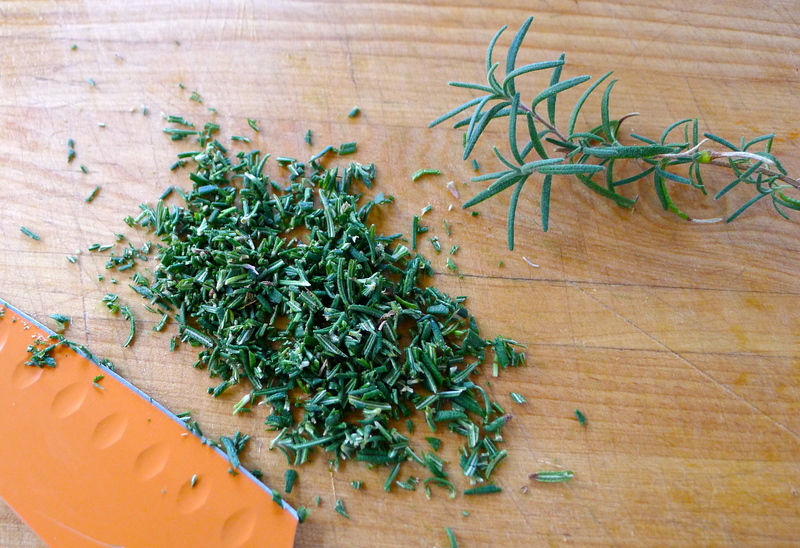 I’m sure any fresh herbs would work, like dill. It was seriously delicious. I’m sure that with fresh yeast, the bread would have risen more and perhaps have been a tad less dense. The process took a while, with the rising and the waiting and the baking and the cooling. 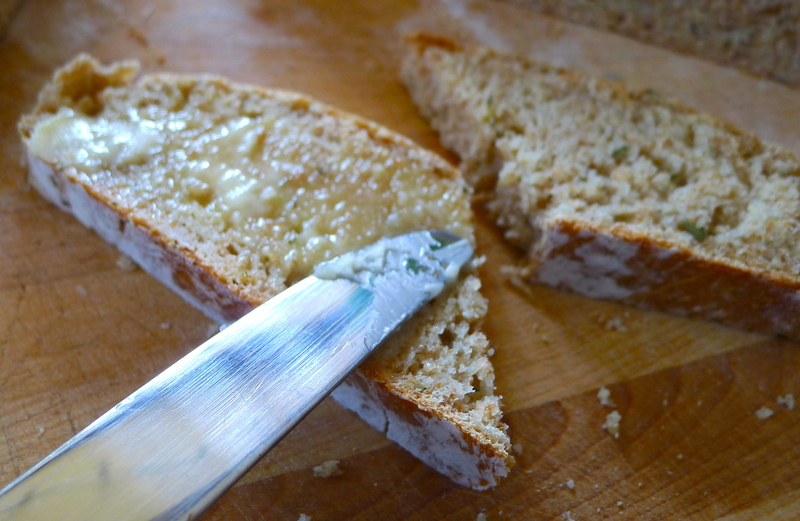 But if you’ve been looking for a good, simple Artisan bread recipe, this is the one. 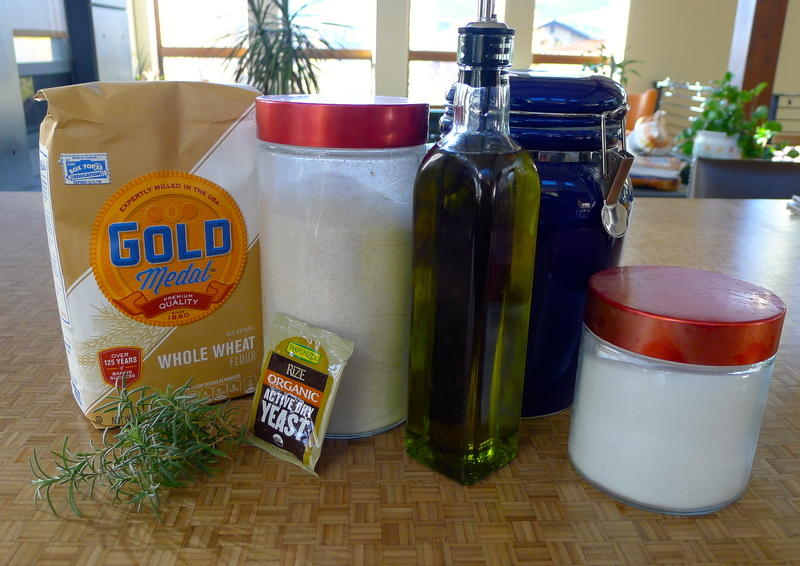 It wasn’t hard, but it felt like a big accomplishment– I’ve always wanted to bake my own bread. Cross Life List item #5 off the list! 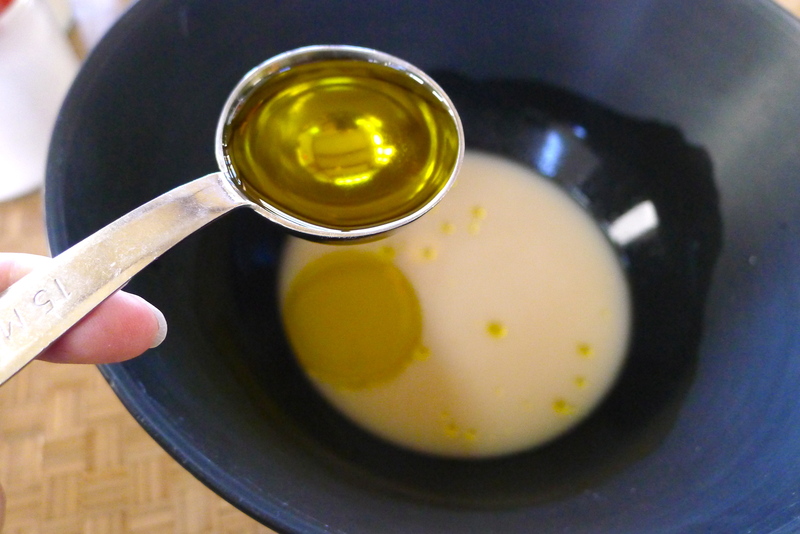 Add warm water to a large bowl. Stir in yeast and sugar and let sit for 5 minutes. It should begin to bubble. 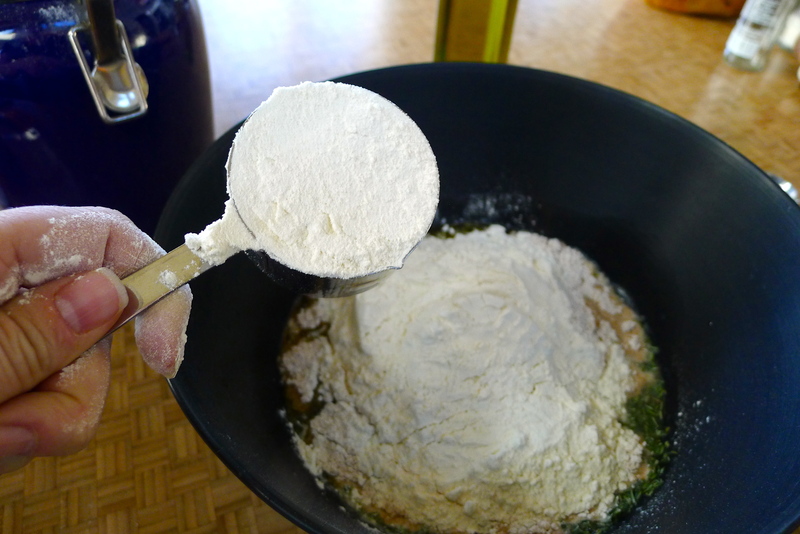 Add the remaining ingredients and stir well to combine all of the flour. 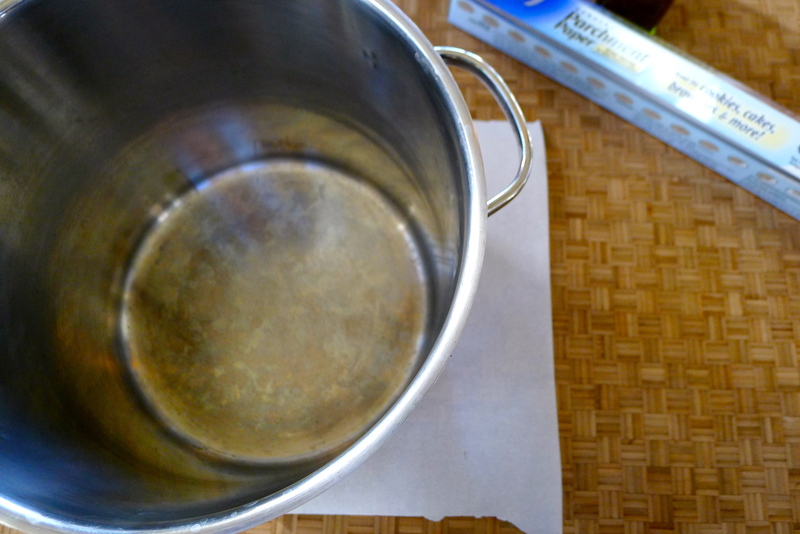 Cover the bowl with a kitchen towel and set it aside at room temperature for about an hour. The dough should rise and collapse. 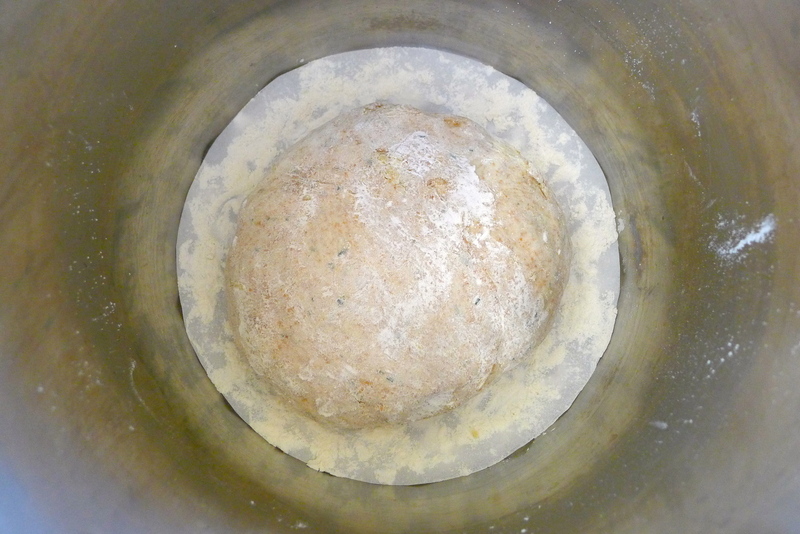 While the dough is rising, place a 3-4 quart pot over a piece of parchment paper and trace a circle to cut out. 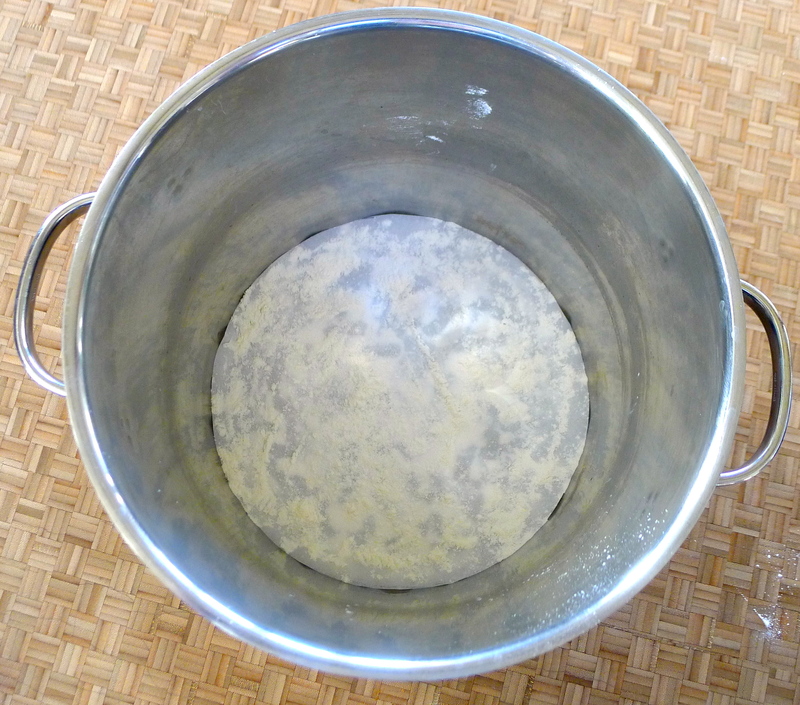 Flour the bottom of the pot, then place the paper over it and flour it again. Preheat oven to 400 degrees. 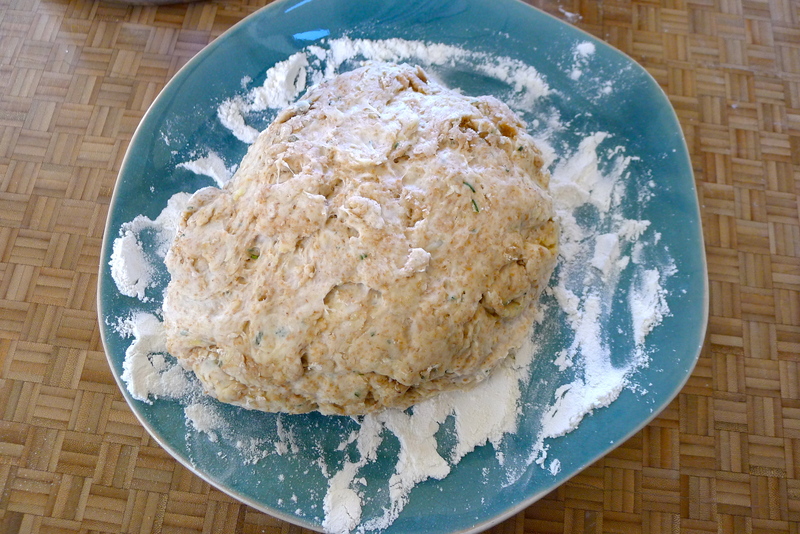 Dump the dough onto a floured surface. Flip it over to coat it with flour. Smooth it into a ball. 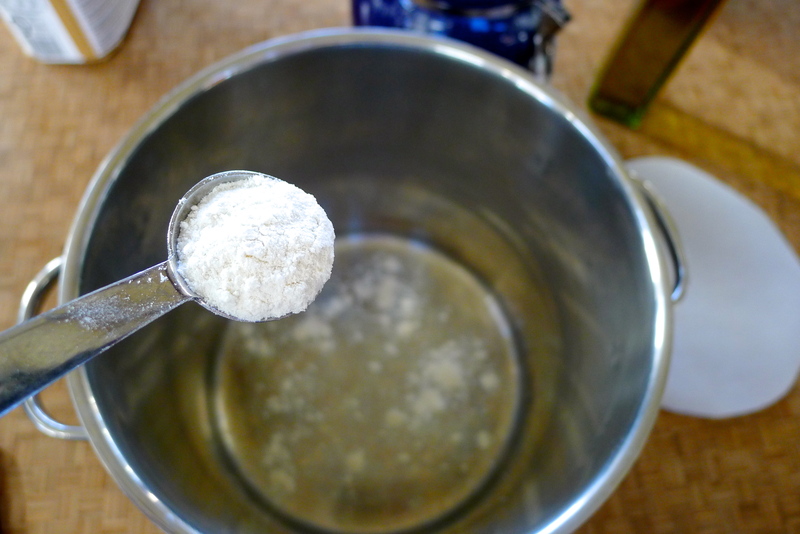 Place the ball into the floured pot and put the lid on. 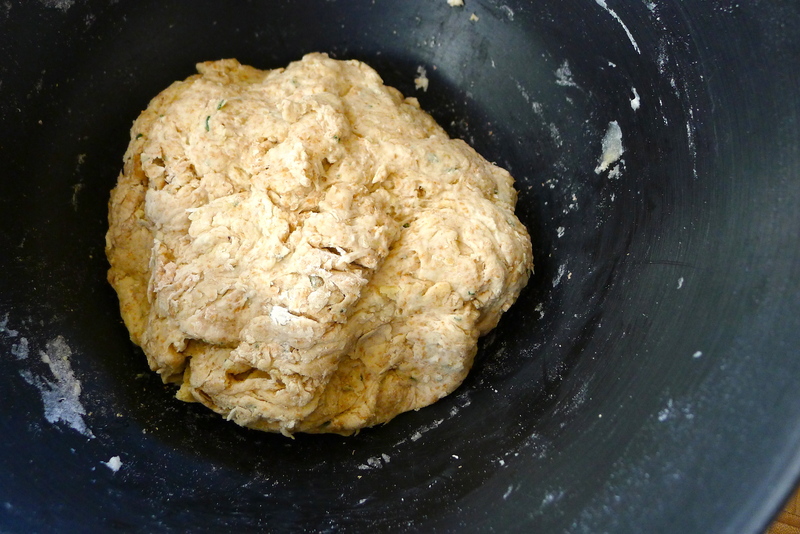 After about 45 minutes, the dough should double in size. 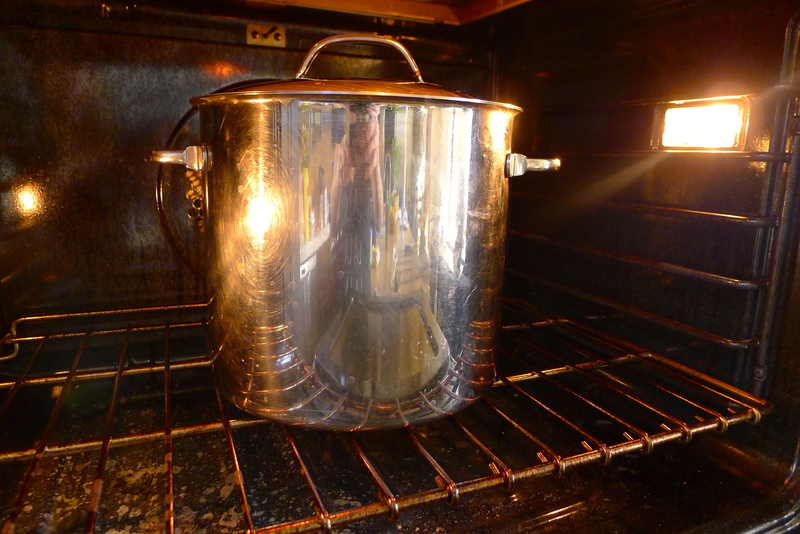 Make slices in the top of the dough, put the lid on the pot, and place the whole pot into the oven. Bake at 400 degrees for 30 minutes, then remove the lid and let it bake for another 20 minutes, or until the bread is browned and beautiful. 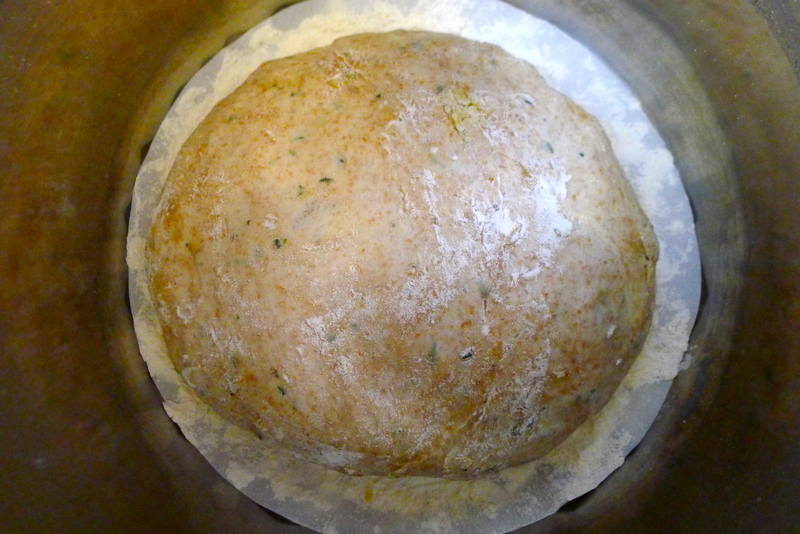 Let the bread cool in the pot for a bit before removing it to a cooling rack. Walk by it several times in awe before slicing into it while it’s still warm. Enjoy every delicious bite and the satisfaction of succeeding at something that intimidated you. YUM. I only have a few months left to accomplish my Life List challenges. Follow along here! Next postA lesson in tenacity (and a lot of tacos). Amber, this just makes me want to hug you! 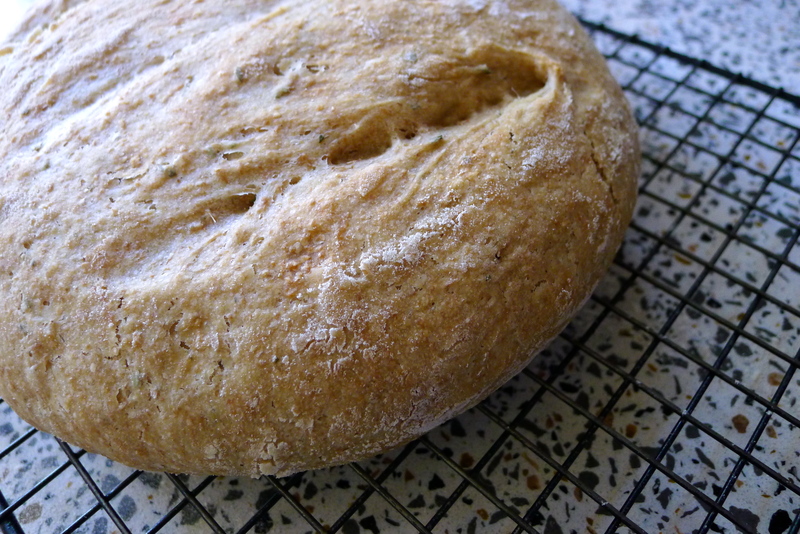 I’m totally sharing in your joy of accomplishing homemade bread. Sounds delicious! High five! Ooooh! Let me know how it turns out for you, Callie! I made focaccia bread yesterday. Yours looks very similar except without all the oil. I have a giant rosemary bush in there yard. 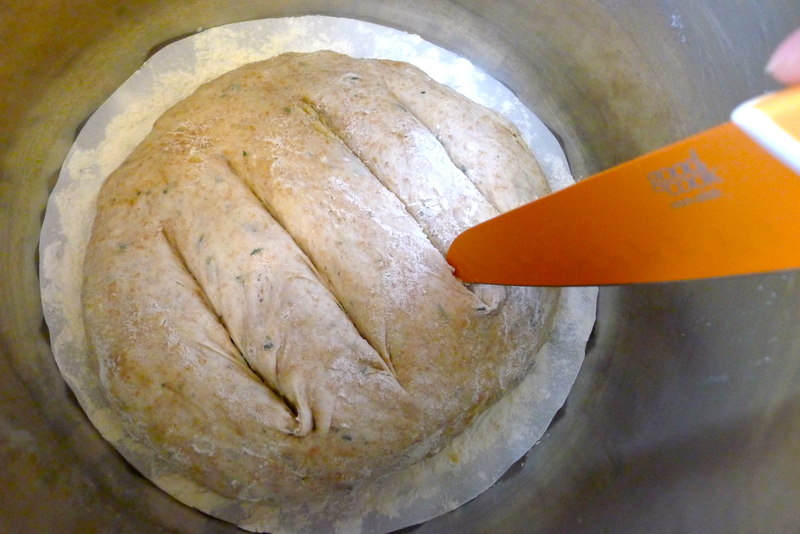 This one’s next — I love the smell that baking bread with fresh herbs creates in my home. And we are here all the time now, thanks to public ed on-line.